For those who have not been following this saga, Durham TAs  are already amongst the lowest paid in the UK. They were originally told in October 2015 that they were having their contracts rewritten due to “legal anomalies” which would have made the Council liable to being sued by other groups of workers. The issue is muddy but TAs salaries have always been spread out in 12 monthly instalments. Now the Council was saying that they should only be paid 39 weeks of the year as they don’t work school holidays. It is a blatant attempt at a wage cut under the guise of “making everyone equal”. In fact it is the first step on the road to making the entire status of TAs more “precarious”. One of the first thing that strikes you is that if this was a real problem why have only two local authorities (Durham and Derby – both Labour-controlled) decided on this, and not any of the others? And where are all these workers supposedly queuing up to sue councils? And support for the TAs certainly did not come from any actions of their unions. Although the TAs are in four different unions (Unison, the ATL, Unite and the GMB) only Unison (to which the vast majority of Durham TAs belong) has negotiating rights with Durham County Council. Handy that, since their offices are also in County Hall! The GMB which has very few TAs accepted the contract immediately. And Unison officials basically started off by advising the TAs to accept what was happening but seek some kind of compensation package (which is what Unison “negotiated” later for Derby TAs but we’ll come to them later). It was the appearance of this committee which represented TAs in all the unions that forced Unison into some token opposition to the County Council. But it took months of effort and several demonstrations on the part of the CDTAAC to get the union to even issue a ballot for strike or other action in support of the campaign. The TAs meanwhile ignored union advice and began to withdraw “goodwill” (i.e. doing all those things that enable the school to function for which they don’t get paid). It was not a step they took lightly but as the first strikes only took place some 13 months after the Council’s threat and less than 2 months before they were all due to be sacked on 31 December 2016 they had little option left. Throughout this whole period the County Council were not slow to issue threats that if the TAs did not sign up to their proposals then they would be all sacked and re-hired on even worse conditions . However, early in 2016, the planned programme of strikes was called off by the unions. Some TAs told us they cried when they found out and others’ voiced criticism of the unions but no-one seems to have thought of insisting that only the Activists Committee could speak for the TAs. 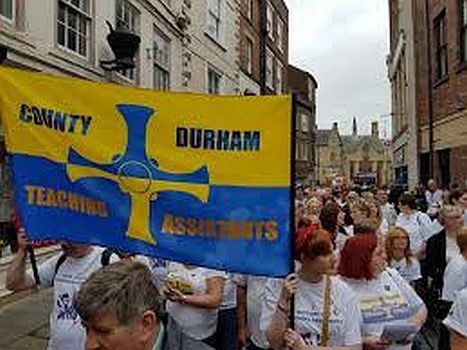 Originally the Durham County Council threatened all Teaching Assistants with the new contract but the struggle at present is confined to primary, nursery and special school assistants. Both Unison and ATL ballots rejected the new offer at the beginning of July. The 215 ATs in the ATL voted 56% to 41% for rejection (3% undecided?) on a 74% turnout. Current adverts for new teaching assistants with Durham County Council are for “term time only” and “pro rata 39 weeks”. This will be resisted by the Council and will have to be fought against. After the latest vote to reject the stitch-up, John Hewitt, the council's corporate director for resources, said: "We recognise the result of the Unison ballot.” But then ominously added "We will continue to work with the recognised trade unions to consider next steps and how we move forward." See County Durham Teaching Assistants reject pay deal on the BBC website July 17 2017. In other words he does not want a challenge to the cosy relationship with the union. Interesting article which shows that communists can intervene in workers struggles. The points made about the role of unions was well made and shows how useless the unions have been in defending even the basics of workers wages and conditions. Lets hope that with the ongoing crisis more workers will become more open to marxist ideas and organisation. Living on the other side of the Channel, I have not been aware at all of this already long drawn out conflict, that shows that neither ‘Labour’ nor ‘trades unions’ defend the interest of the working people. There seems to be a very wicked maneuvering implied in some Labour dominated county councils frontally attacking the working and living conditions of, apparently, a specific professional category in the education sector (the TA’s), with the assistance of a phalanx of ‘trades unions', Unison in the first place. At first sight this conflict appears as almost surreal. Are Durham and Derby really the only counties implied in the UK? It is hard to believe that the Education Ministry is not implied. Furthermore, its long drawn out character raises questions for the workers on how to take and keep their struggle in their own hands: neither an isolated struggle within the confines of a professional category nor a long drawn out conflict seems in the interest of the TA’s and other workers joining them. Good to read that there exists a wider solidarity for the TA’s within the working class, and that they keep their meetings open for those who support their struggle. Secondly, the article raises the question why teachers do not seem that much engaged by this conflict, given that their work is directly impacted and that they are probably next in line for ‘precarization’ of their working conditions? Last but not least, I wonder why the article limits itself to quoting syndicalist illusions expressed in the ‘Socialist Worker’ and has nothing to say about the role of the inevitable water-carriers for keeping any workers’ struggle within the confines of the syndicalist prison that are the Trotskyists. Thanks for your comments and the questions they raise. We think that Durham and Derby are like test cases. Once the TAs have been sold down the river (we think Derby TAs may already be in that situation) in these places then other councils that need to cut their budgets will look at their situation. Already, as the article says, Durham are only employing new TAs on worse conditions. It is to be hoped that the current TAs can keep up their resistance to defend their existing conditions of employment. On the question of the Trotskyists we chose to focus here on the actual struggle (when you went to fight capitalism you don't aim your kicks at the pimples on its arse but at the arse itself). As it is we believe that some of the Activists Committee, if not actually members of Counterfire or the SWP are sympathiser and are actually peddling their polices. The net result is to keep the struggle within the legal framework of the union and the Labour councils. Counterfire (a split from the SWP) unashamedly calls for support for both Labour and Unison (the union with negotiating rights). The SWP is not so enthusiatic about Corbyn but calls for the TAs to put pressure on the Unison to carry on the fight. This is, of course, a travesty of reality since that is precisely what the TAs have been doing whilst the union has repeatedly caved in (calling off strikes after only two days of them had been carried out, settling a deal on council terms, etc). For the TAs the only hope is to break out of the whole Labour Movement framework and fight autonomously. This would be easier if they had less sympathy and more solidarity and other education workers (not just teachers) face a pay freeze which has been going on for years. The problem here is that the primary and special schools involved are relatively small and building a sense of solidarity in them is a lot harder as many feel they are impotent in the face of the union and the council. The threat of losing your job is still a factor.